There are smartwatches, then there are hybrid smartwatches. While gadget fanatics have no qualms about wearing a techy-looking smartwatch on their wrist, others may prefer something a bit more discrete, yet that doesn't skimp on features – something like the hybrid Fossil Q Jacqueline, which has the looks of a traditional watch, but has a variety of smart functions built into it as well. Hybrid smartwatches aren't new. There have been quite a handful from various manufacturers, so what makes this particular one any different or better than the competition? The Fossil Q Jacqueline doesn't stray too far from traditional watch designs, sporting a round face in different colors, with bands to match. 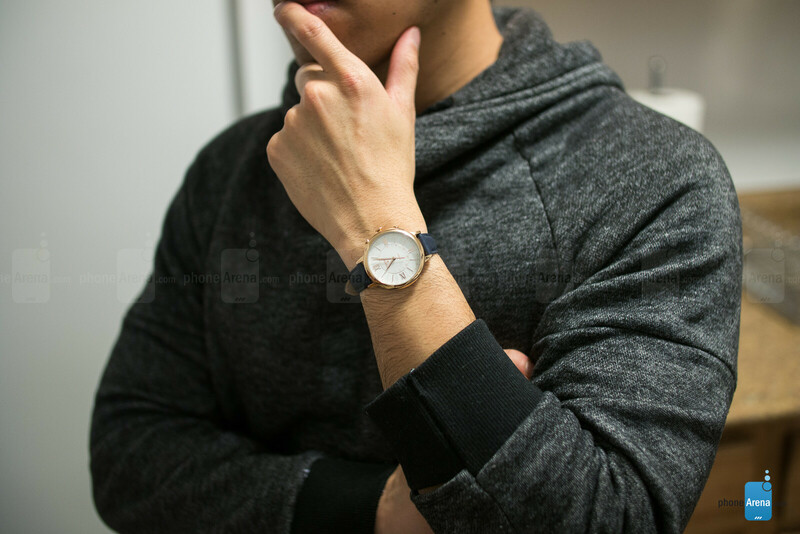 Our particular unit is the stainless-steel base model in a gold-colored finish, accompanied with a simple navy genuine leather strap, all together costing $155. The highest-end version of the Fossil Q Jacqueline tops out at $175, flaunting a rose gold casing with a mesh buckle stainless-steel strap. The Fossil Q Jacqueline is simple, yet very elegant at the same time. Even though it's marketed as a unisex accessory, its quaint size isn't for everyone. Looking at the watch on our wrist, most people would have a difficult time believing it's a smartwatch in some way. And that's the cool thing about its design: it doesn't appear overwhelming like other techy-looking smartwatches, so we really appreciate the discreteness it offers. Additionally, it's worth pointing out that it does feature a water-resistant construction. The circular watch face features two arms, your usual tick markings to tell the time, and numbers from 1 to 31 on the outside edge to indicate the date. Along the right edge we have three buttons that can be customized to perform different functions, which we'll explain in the next section. Replacing the 14mm strap is a simple process because all that's needed is to unlatch the pins, allowing us to quickly replace them with others. And finally, the underside casing can be removed to access its standard CR2025 watch battery. At first glance, the innocuous-looking watch face might appear ordinary, but there's more to it than just time-telling. In fact, the watch face does indeed provide us with notifications, our activity progress, and much more. By default, the current time is shown on the watch face, but the buttons along its side help us to gather all the other information we just mentioned. Notifications, specifically, can be a bit challenging to deal with. Unlike the detailed information that standard smartwatches show, here on the Jacqueline these are indicated by the arms pointing at specific hours on the watch face. You'll have to program what notifications land where. For example, text message and phone call notifications from mom can be set to land on the 1 o'clock tick. This is great if you have certain notifications that you consider of priority, but it can become maddening if multiple notifications are set for the same position. The most practical way of juggling all of these notifications is to choose only a handful of events, rather than being overwhelmed by a bunch. Therefore, it's better to set just one particular type of notification with each position. At the very least, though, the Jacqueline emits a short buzz to indicate an incoming notification after which the arms on the watch face begin to point at the corresponding hour. With the watch paired to an LG V30, we downloaded the accompanying Fossil Q app to customize some of the controls and select our notifications. The three buttons on the watch itself can be set to trigger different functions like showing the date, controlling music playback, ringing our phone if it's lost, and even taking a photo. The "device" tab in the app allows us to choose what controls we want for each button. 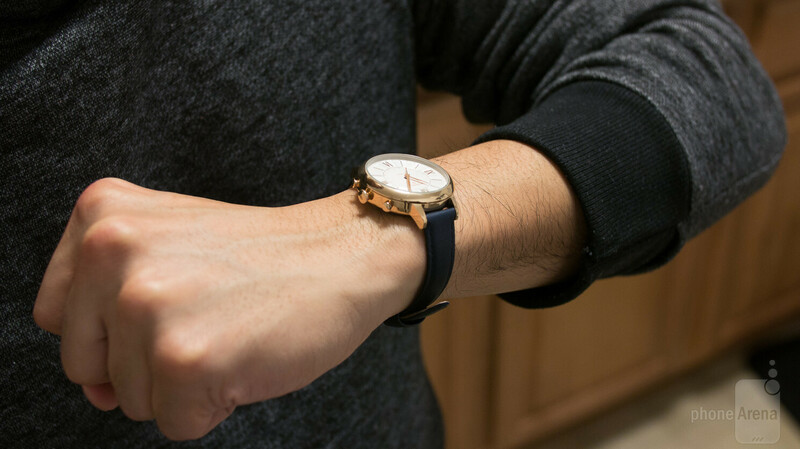 Additionally, the "notifications" tab is the hub where we can choose what notifications we want to see displayed by the smartwatch, indicated by the hour its arms point at. Numbered from 1 to 12, matching what's on the watch face, each number can be set for a finite number of notifications. As we mentioned previously, it can be overwhelming if a certain position is set to display numerous notifications, so it's better to just try to stick with fewer priority ones. And finally, the app is also the hub for displaying step counting and sleep tracking information. Considering that it's hybrid smartwatch, it doesn't surprise us that the Fossil Q Jacqueline is pretty light on fitness tracking features. Seriously, it won't come close to replacing your dedicated fitness tracker or band, but despite that, we still appreciate its ability to count steps. And that's about it! Not only can we see our progress on the watch itself by programming it to one of the buttons on its side, but the app will display our progress in a weekly view. Similarly, the sleep tracking function of the Jacqueline is very limited. It doesn't track detailed information about our sleeping patterns, like the amount of light versus REM sleeping, so it's practically just logging our inactivity during sleep. While it's lacking substance, we suppose that some tracking is better than none at all. The Fossil Q Jacqueline leverages Bluetooth 4.1 LE for its connectivity, so getting it set up the first time was a cinch! Running the Fossil Q Android app, our LG V30 was able to automatically detect and connect to the hybrid smartwatch. Bluetooth Low Energy has become synonymous with fitness trackers and other hybrid smartwatches, so it's no surprise it's found here. However, its range is limited. In our testing, it tops out at around 10 feet – so you'll need to stay in close proximity to your mobile device for the two to remain connected. There's no need to worry about battery life and recharging with this watch, as is can run on a single CR2025 battery for up to 6 months. Of course, that can vary greatly depending on the frequency of the smartwatch needing to sync and receive those notifications. Traditional smartwatches require nightly charges, but here, you'll just simply need to replace the battery after a few months. Pricing is typically a dicey game when it comes to smartwatches, which often cost over $300. However, the Fossil Q Jacqueline is priced moderately between $155 and $175, which is a reasonable price for a hybrid smartwatch. Then again, it's fighting in a space that is already crowded by other offerings. You see, the pricing isn't bad at all, but when it's compared to the $180 to $220 Nokia Steel HR, a relatively new release as well, the Jacqueline just can't stack up against deeper functions offered by Nokia. On the surface, the two function very similarly to one another, but there's just more to the Nokia Steel HR's package. Unless you prefer the Jacqueline's smaller size and overall design, you're better off spending the extra money for the richer experience with the Nokia Steel HR. beautiful dresser watch. activity tracking is a bonus!!! I love that the Jacqueline is smaller actually.